When looking at private jets for shorter journeys, a turbo prop aircraft is ideal for business and personal use. Combining twin propellers and turbine engines, Turboprops have a greater fuel efficiency than their jet engine counterparts. Not only are these aircrafts more fuel efficient, turbo planes can fly from more locations, including small airports with rougher terrain. The propeller design has increased their flexibility to reach more remote locations, allowing them to reverse, slow down and land on runways as small as 600m. The only compromise is the lower cruising speed, yet this is still 340mph. As one of the lightest aircrafts available for private charter, turbo props are perfect for short to mid-range flights, travelling around 1,500 miles and have an average flight time of 2-3 hours. Designed by Beechcraft, the King Air range is a leading the way in turboprops. Seating at least 8 passengers and holding the reputation of being the greenest aircrafts, the King Air is the world’s most popular turboprop aircraft for business travel. Cutting edge avionic technology and oval cabin design increase passenger comfort and make this range of aircraft flexible for travel, placing it at the forefront of business jet hire. 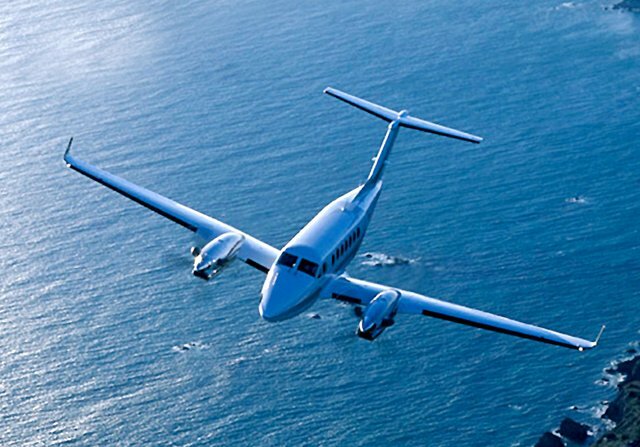 Paving the way in air travel is the King Air 350i and its impressive seating capacity, followed by smaller variants of the King Air 250 and C90GTx. Key Feature: Heated seats, Wifi and dimmable window shades. Key feature: Spacious seating which swivels and reclines. Key feature: Tuned vibration absorbers to reduce noise for a quieter and more comfortable flight. Known for its reliability, Cessna’s Caravan is a single engine aircraft with low operating and emissions costs. It’s adaptable to rugged terrain and is well-equipped for landing and takeoff from unprepared airfields and strips. The choice of the Caravan is becoming increasingly popular for business executives wishing to access more remote locations, as the in-built terrain awareness enhances flight controls over more difficult landscapes. Max Range: 1070nm, Istanbul to Munich. Key feature: Changeable seating to increase passenger or cargo capability, depending on the purpose of the flight. Efficient. Flexible. Spacious. Originally made by Piper in the 1970s, the latest Seneca V has twin turbo engines, the latest technology and the widest cabin in its class. It’s expansive doors make boarding easy, whilst the interior is furnished to the highest standard, perfect for luxury private travel. Max Range: 828nm, from London to Budapest. Key features: Built-in writing table and refreshment console for added flight comfort. Italy makes fast cars but also fast planes. From the Italian company Piaggio, the Avanti is distinctive for its twin turboprop engines, which makes it the fastest twin turboprop in the world. It is even faster than some jets and has a smaller running cost. One bonus design feature is the lower interior noise due to the position of the engines behind the cabin, thus this private jet has an ideal environment for those on business trips. Max Range: 1500nm, from Quebec to Louisville, Kentucky. Key feature: Can be flown by one or two pilots, depending on individual needs.